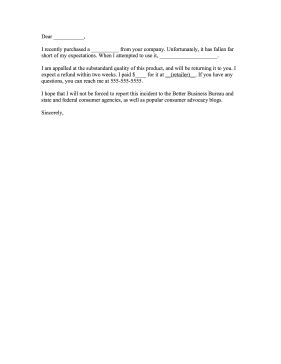 Fill in the blanks of this product complaint letter to let a company know that the item is of poor quality. I recently purchased a __________ from your company. Unfortunately, it has fallen far short of my expectations. When I attempted to use it, _____________________. I am appalled at the substandard quality of this product, and will be returning it to you. I expect a refund within two weeks. I paid $____ for it at __(retailer)__. If you have any questions, you can reach me at 555-555-5555. I hope that I will not be forced to report this incident to the Better Business Bureau and state and federal consumer agencies, as well as popular consumer advocacy blogs.